For other uses, see Haifa (disambiguation). From upper left: View of Haifa at night from Mount Carmel; Bahá'í World Centre; aerial view of the Haifa University; Ahmadiyya Mahmood Mosque; the Carmelit; National Museum of Science, Technology, and Space; view of Haifa during the day from Mount Carmel. Haifa (Hebrew: חֵיפָה Ḥefa [χei̯ˈfa]; Arabic: حيفا‎ Ḥayfa) is the third-largest city in Israel – after Jerusalem and Tel Aviv – with a population of 281,087 in 2017. The city of Haifa forms part of the Haifa metropolitan area, the second- or third-most populous metropolitan area in Israel. It is home to the Bahá'í World Centre, a UNESCO World Heritage Site and a destination for Bahá'í pilgrims. Built on the slopes of Mount Carmel, the settlement has a history spanning more than 3,000 years. The earliest known settlement in the vicinity was Tell Abu Hawam, a small port city established in the Late Bronze Age (14th century BCE). In the 3rd century CE, Haifa was known as a dye-making center. Over the millennia, the Haifa area has changed hands: being conquered and ruled by the Canaanites, Israelites, Phoenicians, Persians, Hasmoneans, Romans, Byzantines, Arabs, Crusaders, Ottomans, and the British. Since the establishment of the State of Israel in 1948, the Haifa Municipality has governed the city. 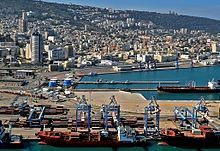 As of 2016[update], the city is a major seaport located on Israel's Mediterranean coastline in the Bay of Haifa covering 63.7 square kilometres (24.6 sq mi). 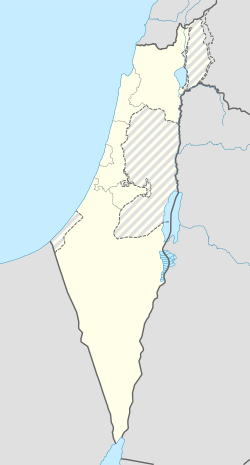 It lies about 90 kilometres (56 mi) north of Tel Aviv and is the major regional center of northern Israel. According to researcher Jonathan Kis-Lev, Haifa is considered a relative haven for coexistence between Jews and Arabs. Two respected academic institutions, the University of Haifa and the Technion, are located in Haifa, in addition to the largest k-12 school in Israel, the Hebrew Reali School. The city plays an important role in Israel's economy. It is home to Matam, one of the oldest and largest high-tech parks in the country; Haifa also owns the only underground rapid transit system located in Israel, known as the Carmelit. Haifa Bay is a center of heavy industry, petroleum refining and chemical processing. Haifa formerly functioned as the western terminus of an oil pipeline from Iraq via Jordan. The ultimate origin of the name Haifa remains unclear. One theory holds it derives from the name of the high priest Caiaphas. Some Christians believe it was named for Saint Peter, whose Aramaic name was Keiphah. Another theory holds it could be derived from the Hebrew verb root חפה (hafa), meaning to cover or shield, i.e. Mount Carmel covers Haifa; others point to a possible origin in the Hebrew word חוֹף (hof), meaning "shore", or חוֹף יָפֶה (hof yafe), meaning "beautiful shore". Other spellings in English included Caipha, Kaipha, Caiffa, Kaiffa and Khaifa. The earliest named settlement within the area of modern-day Haifa was a city known as Sycaminum. The remains of the ancient town can be found in a coastal tell, or archaeological mound, known in Hebrew as Tel Shikmona, meaning "mound of the Ficus sycomorus", and in Arabic as Tell el-Semak or Tell es-Samak, meaning "mound of the sumak trees", names that preserved and transformed the ancient name, by which the town is mentioned once in the Mishnah (composed c. 200 CE) for the wild fruits that grow around it. The name Efa first appears during Roman rule, some time after the end of the 1st century, when a Roman fortress and small Jewish settlement were established not far from Tel Shikmona. Haifa is also mentioned more than 100 times in the Talmud, a work central to Judaism. Hefa or Hepha in Eusebius of Caesarea's 4th-century work, Onomasticon (Onom. 108, 31), is said to be another name for Sycaminus. This synonymizing of the names is explained by Moshe Sharon, who writes that the twin ancient settlements, which he calls Haifa-Sycaminon, gradually expanded into one another, becoming a twin city known by the Greek names Sycaminon or Sycaminos Polis. References to this city end with the Byzantine period. Around the 6th century, Porphyreon or Porphyrea is mentioned in the writings of William of Tyre, and while it lies within the area covered by modern Haifa, it was a settlement situated south of Haifa-Sycaminon. Following the Arab conquest in the 7th century, Haifa was used to refer to a site established on Tel Shikmona upon what were already the ruins of Sycaminon (Shiqmona). Haifa (or Haifah) is mentioned by the mid-11th-century Persian chronicler Nasir Khusraw, and the 12th- and 13th-century Arab chroniclers, Muhammad al-Idrisi and Yaqut al-Hamawi. The Crusaders, who captured Haifa briefly in the 12th century, call it Caiphas, and believe its name related to Cephas, the Aramaic name of Simon Peter. Eusebius is also said to have referred to Hefa as Caiaphas civitas, and Benjamin of Tudela, the 12th-century Jewish traveller and chronicler, is said to have attributed the city's founding to Caiaphas, the Jewish high priest at the time of Jesus. Haifa al-'Atiqa (Arabic: "Ancient Haifa") is another name used by some locals to refer to Tell es-Samak, when it was the site of Haifa while a hamlet of 250 residents, before it was moved in 1764-5 to a new fortified site founded by Zahir al-Umar 1.5 miles (2.4 kilometres) to the east. The new village, the nucleus of modern Haifa, was first called al-imara al-jadida (Arabic: "the new construction") by some, but others residing there called it Haifa al-Jadida (Arabic: "New Haifa") at first, and then simply Haifa. In the early 20th century, Haifa al 'Atiqa was repopulated with many Arab Christians in an overall neighborhood in which many Middle Eastern Jews were established inhabitants, as Haifa expanded outward from its new location. A town known today as Tell Abu Hawam was established during the Late Bronze Age (14th century BCE). It was a port and fishing village. Mount Carmel and the Kishon River are mentioned in the Hebrew Bible. In the 6th century BCE, during the Persian period, Greek geographer Scylax wrote of a city "between the bay and the Promontory of Zeus" (i.e., the Carmel), which may be a reference to Shikmona, a locality in the Haifa area. By Hellenistic times, the city had moved to a new site south of what is now Bat Galim because the old port's harbour had become blocked with sand. A Greek-speaking population living along the coast at this time was engaged in commerce. Haifa was located near the town of Shikmona, a center for making the traditional Tekhelet dye used in the garments of the high priests in the Temple. The archaeological site of Shikmona is southwest of Bat Galim. Early Haifa is believed to have occupied the area which extends from the present-day Rambam Hospital to the Jewish Cemetery on Yafo Street. The inhabitants engaged in fishing and agriculture. About the 3rd century CE, the city was first mentioned in Talmudic literature, as a Jewish fishing village and the home of Rabbi Avdimi and other Jewish scholars. Under Byzantine rule, Haifa continued to grow but did not assume major importance. Following the Arab conquest of Palestine in the 630s-40s, Haifa was largely overlooked in favor of the port city of 'Akka. Under the Rashidun Caliphate, Haifa began to develop. In the 9th century under the Umayyad and Abbasid Caliphates, Haifa established trading relations with Egyptian ports and the city featured several shipyards. The inhabitants, Arabs and Jews, engaged in trade and maritime commerce. Glass production and dye-making from marine snails were the city's most lucrative industries. Prosperity ended in 1100 or 1101, when Haifa was besieged and blockaded by European Christians shortly after the end of the First Crusade, and then conquered after a fierce battle with its Jewish inhabitants and Fatimid garrison. Under the Crusaders, Haifa was reduced to a small fortified coastal stronghold. It was a part of the Principality of Galilee within the Kingdom of Jerusalem. Following their victory at the Battle of Hattin, Saladin's Ayyubid army captured Haifa in mid-July 1187 and the city's Crusader fortress was destroyed. The Crusaders under Richard the Lionheart retook Haifa in 1191. In the 12th century religious hermits started inhabiting the caves on Mount Carmel, and in the 13th century they formed a new Catholic monastic order, the Carmelites. Under Muslim rule, the church which they had built on Mount Carmel was turned into a mosque, later becoming a hospital. In the 19th century, it was restored as a Carmelite monastery, the Stella Maris Monastery. The altar of the church as we see it today, stands over a cave associated with Prophet Elijah. In 1265, the army of Mamluk sultan Baibars captured Haifa, destroying its fortifications, which had been rebuilt by King Louis IX of France, as well as the majority of the city's homes to prevent the European Crusaders from returning. For much of the Mamluk period between the 13th and 16th centuries, the city was desolate. Information from this period is scarce. During Mamluk rule in the 14th century, al-Idrisi wrote that Haifa served as the port for Tiberias and featured a "fine harbor for the anchorage of galleys and other vessels. In 1596, Haifa appeared in Ottoman tax registers as being in the Nahiya of Sahil Atlit of the Liwa of Lajjun. It had a population of 32 Muslim households and paid taxes on wheat, barley, summer crops, olives, and goats or beehives. Haifa was a hamlet of 250 inhabitants in 1764-5. It was located at Tell el-Semak, the site of ancient Sycaminum. In 1765 Zahir al-Umar, the Arab ruler of Acre and the Galilee, moved the population to a new fortified site 1.5 miles (2.4 kilometres) to the east and laid waste to the old site. According to historian Moshe Sharon, the new Haifa was established by Zahir in 1769. This event marked the beginning of the town's life at its modern location. After al-Umar's death in 1775, the town remained under Ottoman rule until 1918, with the exception of two brief periods. In 1799, Napoleon Bonaparte conquered Haifa during his unsuccessful campaign to conquer Palestine and Syria, but he soon had to withdraw; in the campaign's final proclamation, Napoleon took credit for having razed the fortifications of "Kaïffa" (as the name was spelled at the time) along with those of Gaza, Jaffa and Acre. Between 1831 and 1840, the Egyptian viceroy Muhammad Ali governed Haifa, after his son Ibrahim Pasha had wrested control over it from the Ottomans. When the Egyptian occupation ended and Acre declined, the importance of Haifa rose. The British Survey of Western Palestine estimated Haifa's population to be about 3,000 in 1859. The arrival of German messianics, many of whom were Templers, in 1868, who settled in what is now known as the German Colony of Haifa, was a turning point in Haifa's development. The Templers built and operated a steam-based power station, opened factories and inaugurated carriage services to Acre, Nazareth and Tiberias, playing a key role in modernizing the city. The first major wave of Jewish immigration to Haifa took place in the mid-19th century from Morocco, with a smaller wave of immigration from Turkey a few years later. In the 1870s, large numbers of Jewish and Arab migrants came to Haifa due to the town's growing prosperity. Jews constituted one-eighth of Haifa's population, almost all of whom were recent immigrants from Morocco and Turkey who lived in the Jewish Quarter, which was located in the eastern part of the town. Continued Jewish immigration gradually raised the Jewish population of Haifa, and included a small number of Ashkenazi families, most of whom opened hotels for Jewish migrants coming into the city. A wave of European Jews arrived at the end of the 19th century from Romania. The Central Jewish Colonisation Society in Romania purchased over 1,000 acres (4.0 km2) near Haifa. As the Jewish settlers had been city dwellers, they hired the former fellahin tenants to instruct them in agriculture. The First Aliyah of the late 19th century and the Second Aliyah of the early 20th century saw Jewish immigrants, mainly from Eastern Europe, arrive in Haifa in significant numbers. The Jewish population rose from 1,500 in 1900 to 3,000 on the eve of World War I. 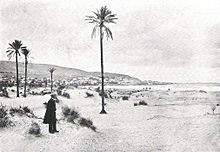 In 1909, Haifa became important to the Bahá'í Faith when the remains of the Báb, founder of the Bábí Faith and forerunner of Bahá'u'lláh in the Bahá'í Faith, were moved from Acre to Haifa and interred in the shrine built on Mount Carmel. 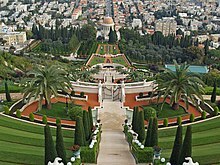 Bahá'ís consider the shrine to be their second holiest place on Earth after the Shrine of Bahá'u'lláh in Acre. Its precise location on Mount Carmel was shown by Bahá'u'lláh himself to his eldest son, `Abdu'l-Bahá, in 1891. `Abdu'l-Bahá planned the structure, which was designed and completed several years later by his grandson, Shoghi Effendi. In a separate room, the remains of `Abdu'l-Bahá were buried in November 1921. In the early 20th century, Haifa began to emerge as an industrial port city and growing population center. A branch of the Hejaz railway, known as the Jezreel Valley railway, was built between 1903 and 1905. The railway increased the city's volume of trade, and attracted workers and foreign merchants. In 1912, construction began on the Technion Institute of Technology, a Jewish technical school that was to later become one of Israel's top universities, although studies did not begin until 1924. The Jews of Haifa also founded numerous factories and cultural institutions. 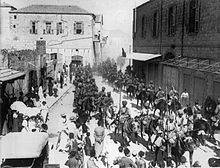 Haifa was captured from the Ottomans in September 1918 by Indian horsemen of the British Army armed with spears and swords who overran Ottoman positions. On 22 September, British troops were heading to Nazareth when a reconnaissance report was received indicating that the Turks were leaving Haifa. The British made preparations to enter the city and came under fire in the Balad al-Sheikh district (today Nesher). After the British regrouped, an elite unit of Indian horsemen were sent to attack the Turkish positions on the flanks and overrun their artillery guns on Mount Carmel. Under the British Mandate, Haifa saw large-scale development and became an industrial port city. The Bahá'í Faith in 1918 and today has its administrative and spiritual centre in the environs of Haifa. Many Jewish immigrants of the Fourth Aliyah and Fifth Aliyah settled in Haifa. The port was a major source of income, and the nearby towns of the Krayot were established in the 1930s. At the same time, the Arab population also swelled by an influx of migrants, coming mainly from surrounding villages as well as Syrian Hauran. The Arab immigration mainly came as a result of prices and salary drop. The 1922 census of Palestine, conducted by the British authorities, recorded Haifa as having a population of 9,377 Muslims, 8,863 Christians, 6,230 Jews, and 164 others. By the time of the 1931 census of Palestine, this had increased to 20,324 Muslims, 13,824 Christians, 15,923 Jews, and 332 others. Between the censuses of 1922 and 1931, the Muslim, Jewish, and Christian populations rose by 217%, 256%, and 156%, respectively. In 1938, 52,000 Jews and 51,000 Muslims and Christians lived in Haifa. Haifa's development owed much to British plans to make it a central port and hub for Middle-East crude oil. The British Government of Palestine developed the port and built refineries, thereby facilitating the rapid development of the city as a center for the country's heavy industries. Haifa was also among the first towns to be fully electrified. The Palestine Electric Company inaugurated the Haifa Electrical Power Station already in 1925, opening the door to considerable industrialization. The State-run Palestine Railways also built its main workshops in Haifa. By 1945 the population had shifted to 33% Muslim, 20% Christian and 47% Jewish. In 1947, about 70,910 Arabs (41,000 Muslims and 29,910 Christians) and 74,230 Jews were living there. The Christian community were mostly Greek-Melkite Catholics. The 1947 UN Partition Plan in late November 1947 designated Haifa as part of the proposed Jewish state. Arab protests over that decision evolved into violence between Jews and Arabs that left several dozen people dead during December. The Arab city was in anarchy. The local Arab national committee tried to stabilize the situation by organizing garrison, calming the frightened residents and to stop the flight. In a public statement, the national committee called upon the Arab residents to obey orders, be alert, keep calm, and added: "Keep away the cowards who wish to flee. Expell them from your lines. Despise them, because they harm more than the enemy". Despite the efforts, Arab residents abandoned the streets which bordered Jewish neighborhoods and during the days of the general strike instigated by the Arab Higher Committee, some 250 Arab families abandoned the Khalisa neighborhood. On 30 December 1947, members of the Irgun, a Jewish underground militia, threw bombs into a crowd of Arabs outside the gates of the Consolidated Refineries in Haifa, killing six and injuring 42. In response Arab employees of the company killed 39 Jewish employees in what became known as the Haifa Oil Refinery massacre. The Jewish Haganah militia retaliated with a raid on the Arab village of Balad al-Shaykh, where many of the Arab refinery workers lived, in what became known as the Balad al-Shaykh massacre. British forces in Haifa redeployed on 21 April 1948, withdrawing from most of the city while still maintaining control over the port facilities. Two days later the downtown, controlled by a combination of local and foreign (ALA) Arab irregulars was assaulted by Jewish forces in Operation Bi'ur Hametz, by the Carmeli Brigade of the Haganah, commanded by Moshe Carmel. The operation led to a massive displacement of Haifa's Arab population. According to The Economist at the time, only 5,000–6,000 of the city's 62,000 Arabs remained there by 2 October 1948. Contemporaneous sources emphasized the Jewish leadership's attempt to stop the Arab exodus from the city and the Arab leadership as a motivating factor in the refugees' flight. According to the British district superintendent of police, "Every effort is being made by the Jews to persuade the Arab populace to stay and carry on with their normal lives, to get their shops and business open and to be assured that their lives and interests will be safe." Time Magazine wrote on 3 May 1948: "The mass evacuation, prompted partly by fear, partly by orders of Arab leaders, left the Arab quarter of Haifa a ghost city ... By withdrawing Arab workers their leaders hoped to paralyze Haifa." Benny Morris said Haifa's Arabs left due to a combination of Zionist threats and encouragement to do so by Arab leaders. Ilan Pappé writes that the shelling culminated in an attack on a Palestinian crowd in the old marketplace using three-inch (76 mm) mortars on 22 April 1948. Shabtai Levy, the Mayor of the city, and some other Jewish leaders urged Arabs not to leave. According to Ilan Pappé, Jewish loudspeakers could be heard in the city ordering Arab residents to leave "before it's too late." Morris quotes British sources as stating that during the battles between 22 and 23 April 100 Arabs were killed and 100 wounded, but he adds that the total may have been higher. After the Declaration of the Establishment of the State of Israel on 14 May 1948 Haifa became the gateway for Jewish immigration into Israel. During the 1948 Arab–Israeli War, the neighborhoods of Haifa were sometimes contested. 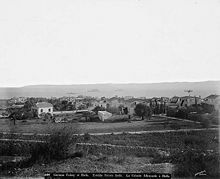 After the war, Jewish immigrants were settled in new neighborhoods, among them Kiryat Hayim, Ramot Remez, Ramat Shaul, Kiryat Sprinzak, and Kiryat Eliezer. Bnei Zion Hospital (formerly Rothschild Hospital) and the Central Synagogue in Hadar Hacarmel date from this period. In 1953, a master plan was created for transportation and the future architectural layout. In 1959, a group of Sephardi and Mizrahi Jews, mostly Moroccan Jews, rioted in Wadi Salib, claiming the state was discriminating against them. Their demand for "bread and work" was directed at the state institutions and what they viewed as an Ashkenazi elite in the Labor Party and the Histadrut. Tel Aviv gained in status, while Haifa suffered a decline in the role as regional capital. The opening of Ashdod as a port exacerbated this. Tourism shrank when the Israeli Ministry of Tourism placed emphasis on developing Tiberias as a tourist centre. Nevertheless, Haifa's population had reached 200,000 by the early 1970s, and mass immigration from the former Soviet Union boosted the population by a further 35,000. Many of Wadi Salib's historic Ottoman buildings have now been demolished, and in the 1990s a major section of the Old City was razed to make way for a new municipal center. From 1999 to 2003, several Palestinian suicide attacks took place in Haifa (in Maxim and Matza restaurants, bus 37, and others), killing 68 civilians. 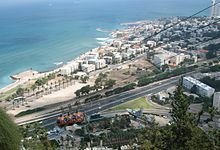 In 2006, Haifa was hit by 93 Hezbollah rockets during the Second Lebanon War, killing 11 civilians and leading to half of the city's population fleeing at the end of the first week of the war. Among the places hit by rockets were a train depot and the oil refinery complex. 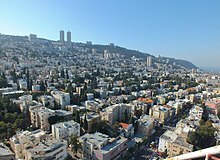 Haifa is Israel's third-largest city, consisting of 103,000 households, or a population of 281,087. Immigrants from the former Soviet Union constitute 25% of Haifa's population. According to the Israeli Central Bureau of Statistics, Israeli Arabs constitute 10% of Haifa's population, the majority living in Wadi Nisnas, Abbas and Halissa neighborhoods. Haifa is commonly portrayed as a model of co-existence between Arabs and Jews, although tensions and hostility do still exist. Between 1994 and 2009, the city had a declining and aging population compared to Tel Aviv and Jerusalem, as young people moved to the center of the country for education and jobs, while young families migrated to bedroom communities in the suburbs. However, as a result of new projects and improving infrastructure, the city managed to reverse its population decline, reducing emigration while attracting more internal migration into the city. In 2009, positive net immigration into the city was shown for the first time in 15 years. A development plan approved in 2016 seeks to raise Haifa's population to 330,000 residents by 2025. The population is heterogeneous. Israeli Jews comprise some 82% of the population, almost 14% are Christians (the majority of whom are Arab Christians) and, some 4% are Muslims (of which many are Ahmadis). Haifa also includes Druze and Bahá'í communities. In 2006, 27% of the Arab population was aged 14 and under, compared to 17% of the Jewish and other population groups. The trend continues in the age 15–29 group, in which 27% of the Arab population is found, and the age 30–44 group (23%). The population of Jews and others in these age groups are 22% and 18% respectively. Nineteen percent of the city's Jewish and other population is between 45 and 59, compared to 14% of the Arab population. This continues with 14% of Jews and others aged 60–74 and 10% over age 75, in comparison to 7% and just 2% respectively in the Arab population. In 2006, 2.9% of the Jews in the city were Haredi, compared to 7.5% on a national scale. However, the Haredi community in Haifa is growing fast due to a high fertility rate. 66.6% were secular, compared to a national average of 43.7%. 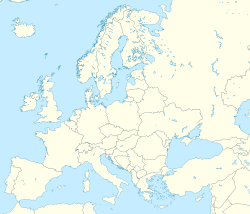 A significant portion of the immigrants from the former Soviet Union either lack official religious-ethnic classification or are Non-Jews as they are from mixed-marriage families of some Jewish origin. There is also a Scandinavian Seamen Protestant church, established by Norwegian Righteous Among the Nations pastor Per Faye-Hansen. Haifa is the center of liberal Arabic-speaking culture, as it was under British colonial rule. The Arabic-speaking neighborhoods, which are mixed Muslim and Christian, are in the lowlands near the sea, while Jewish neighborhoods are at higher elevation. An active Arab cultural life has developed in the 21st century. The Carmel Mountain has three main wadis: Lotem, Amik and Si'ach. For the most part these valleys are undeveloped natural corridors that run up through the city from the coast to the top of the mountain. Marked hiking paths traverse these areas and they provide habitat for wildlife such as wild boar, golden jackal, hyrax, Egyptian mongoose, owls and chameleons. Haifa has a hot-summer Mediterranean climate with hot, dry summers and cool, rainy winters (Köppen climate classification Csa). Spring arrives in March when temperatures begin to increase. By late May, the temperature has warmed up considerably to herald warm summer days. The average temperature in summer is 26 °C (79 °F) and in winter, 12 °C (54 °F). Snow is rare in Haifa, but temperatures around 3 °C (37 °F) can sometimes occur, usually in the early morning. Humidity tends to be high all year round, and rain usually occurs between September and May. Annual precipitation is approximately 629 millimeters (25 in). Haifa has developed in tiers, from the lower to the upper city on the Carmel. The oldest neighborhood in modern Haifa is Wadi Salib, the Old City center near the port, which has been bisected by a major road and razed in part to make way for government buildings. Wadi Salib stretches across to Wadi Nisnas, the center of Arab life in Haifa today. In the 19th century, under Ottoman rule, the German Colony was built, providing the first model of urban planning in Haifa. Some of the buildings have been restored and the colony has turned into a center of Haifa nightlife. The first buildings in Hadar were constructed at the start of the 20th century. Hadar was Haifa's cultural center and marketplace throughout the 1920s and into the 1980s, nestled above and around Haifa's Arab neighborhoods. Today Hadar stretches from the port area near the bay, approximately halfway up Mount Carmel, around the German Colony, Wadi Nisnas and Wadi Salib. Hadar houses two commercial centers (one in the port area, and one midway up the mountain) surrounded by some of the city's older neighborhoods. Neve Sha'anan, a neighborhood located on the second tier of Mount Carmel, was founded in the 1920s. 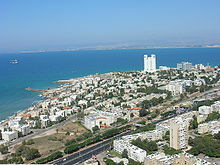 West of the port are the neighborhoods of Bat Galim, Shikmona Beach, and Kiryat Eliezer. To the west and east of Hadar are the Arab neighborhoods of Abbas and Khalisa, built in the 1960s and 70s. To the south of Mount Carmel's headland, along the road to Tel Aviv, are the neighborhoods of Ein HaYam, Shaar HaAliya, Kiryat Sprinzak and Neve David. Above Hadar are affluent neighborhoods such as the Carmel Tzarfati (French Carmel), Merkaz HaCarmel, Romema, Ahuzat Ha'Carmel (Ahuza), Carmeliya, Vardiya, Ramat Golda, Ramat Alon and Hod Ha'Carmel (Denya). While there are general divisions between Arab and Jewish neighborhoods, there is an increasing trend for wealthy Arabs to move into affluent Jewish neighborhoods. Another of the Carmel neighborhoods is Kababir, home to the National Headquarters of Israel's Ahmadiyya Muslim Community; located near Merkaz HaCarmel and overlooking the coast. Recently, residential construction has been concentrated around Kiryat Haim and Kiryat Shmuel, with 75,000 m2 (807,293 sq ft) of new residential construction between 2002–2004, the Carmel, with 70,000 m2 (753,474 sq ft), and Ramot Neve Sha'anan with approximately 70,000 m2 (753,474 sq ft) Non-residential construction was highest in the Lower Town, (90,000 sq m), Haifa Bay (72,000 sq m) and Ramot Neve Sha'anan (54,000 sq m). In 2004, 80% of construction in the city was private. Currently, the city has a modest number of skyscrapers and high-rise buildings. Though buildings rising up to 20 stories were built on Mount Carmel in the past, the Haifa municipality banned the construction of any new buildings taller than nine stories on Mount Carmel in July 2012. The neighborhood of Wadi Salib, located in the heart of downtown Haifa, is being redeveloped. Most of its Jewish and Arab residents are considered squatters and have been gradually evicted over the years. The Haifa Economic Corporation Ltd is developing two 1,000 square meter lots for office and commercial use. Some historic buildings have been renovated and redeveloped, especially into nightclubs and theaters, such as the Palace of the Pasha, a Turkish bathhouse, and a Middle Eastern music and dance club, which has been converted into theaters and offices. In 2012, a new, massive development plan was announced for Haifa's waterfront. According to the plan, the western section of the city's port will be torn down, and all port activity will be moved to the east. The west side of the port will be transformed into a tourism and nightlife center and a point of embarkation and arrival for sea travel through the construction of public spaces, a beach promenade, and the renovation of commercial buildings. The train tracks that currently bisect the city and separate the city's beach from the rest of Haifa will also be buried. A park will be developed on the border of the Kishon River, the refineries' cooling towers will be turned into a visitors' center, and bridges will lead from the port to the rest of the city. Massive renovations are also currently underway in Haifa's lower town, in the Turkish market and Paris Square, which will become the city's business center. In addition, the ammonia depository tank in the Haifa bay industrial zone will be dismantled, and a new one built in an alternative location. Another plan seeks to turn the western section of Haifa Port into a major tourism and nightlife center, as well as a functioning point of embarkation and arrival for sea travel. All port activity will be moved to the western side, and the area will be redeveloped. Public spaces and a beach promenade will be developed, and commercial buildings will be renovated. As part of the development plans, the Israeli Navy, which has a large presence in Haifa, will withdraw from the shoreline between Bat Galim and Hof Hashaket. A 5-kilometer (3.1-mile) long esplanade which will encircle the shoreline will be constructed. It will include a bicycle path, and possibly also a small bridge under which navy vessels will pass on their way to the sea. In addition, a 50,000 square-meter entertainment complex that will contain a Disney theme park, cinemas, shops, and a 25-screen Multiplex theater will be built at the Check Post exit from the Carmel Tunnels. In 2014, a new major plan for the city was proposed, under which extensive development of residential, business, and leisure areas will take place with the target of increasing the city's population by 60,000 by 2025. Under the plan, five new neighborhoods will be built, along with new high-tech parks. In addition, existing employment centers will be renovated, and new leisure areas and a large park will be built. In 2016, a new plan for the city was approved. The plan included a new main downtown business district, the creation of a park in a current industrial area, new construction and renovation of public buildings and hubs of higher education, tourism, culture, commerce, leisure, and residence. 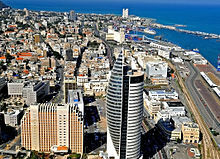 The common Israeli saying, "Haifa works, Jerusalem prays, and Tel Aviv plays" attests to Haifa's reputation as a city of workers and industry. 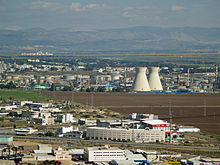 The industrial region of Haifa is in the eastern part of the city, around the Kishon River. It is home to the Haifa oil refinery, one of the two oil refineries in Israel (the other refinery being located in Ashdod). The Haifa refinery processes 9 million tons (66 million barrels) of crude oil a year. Its nowadays unused twin 80-meter high cooling towers, built in the 1930s, were the tallest buildings built in the British Mandate period. 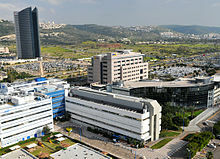 Matam (short for Merkaz Ta'asiyot Mada – Scientific Industries Center), the largest and oldest business park in Israel, is at the southern entrance to the city, hosting manufacturing and R&D facilities for a large number of Israeli and international hi-tech companies, such as Intel, IBM, Microsoft, Motorola, Google, Yahoo!, Elbit, CSR, Philips, and Amdocs. The campus of the University of Haifa is also home to IBM Haifa Labs. The Port of Haifa is the leader in passenger traffic among Israeli ports, and is also a major cargo harbor, although deregulation has seen its dominance challenged by the Port of Ashdod. Haifa malls and shopping centers include Hutsot Hamifratz, Horev Center Mall, Panorama Center, Castra Center, Colony Center (Lev HaMoshava), Hanevi'im Tower Mall, Kanyon Haifa, Lev Hamifratz Mall and Grand Kanyon. In 2010, Monocle magazine identified Haifa as the city with the most promising business potential, with the greatest investment opportunities in the world. The magazine noted that "a massive head-to-toe regeneration is starting to have an impact; from scaffolding and cranes around town, to renovated façades and new smart places to eat". The Haifa municipality had spent more than $350 million on roads and infrastructure, and the number of building permits had risen 83% in the previous two years. In 2014, it was announced that a technology-focused stock exchange would be established to compete with the Tel Aviv Stock Exchange. Currently, some 40 hotels, mostly boutique hotels, are planned, have been approved, or are under construction. The Haifa Municipality is seeking to turn the city into Northern Israel's tourist center, from where travelers can embark on day trips into Acre, Nazareth, Tiberias, and the Galilee. A new life sciences industrial park containing five buildings with 85,000 square meters of space on a 31-duman (7.75 acre) site is being built adjacent to the Matam industrial park. A 2007 report commissioned by the Haifa Municipality calls for the construction of more hotels, a ferry line between Haifa, Acre and Caesarea, development of the western anchorage of the port as a recreation and entertainment area, and an expansion of the local airport and port to accommodate international travel and cruise ships. Despite its image as a port and industrial city, Haifa is the cultural hub of northern Israel. During the 1950s, mayor Abba Hushi made a special effort to encourage authors and poets to move to the city, and founded the Haifa Theatre, a repertory theater, the first municipal theater founded in the country. The principal Arabic theater servicing the northern Arab population is the al-Midan Theater. Other theaters in the city include the Krieger Centre for the Performing Arts and the Rappaport Art and Culture Center. The Congress Center hosts exhibitions, concerts and special events. The New Haifa Symphony Orchestra, established in 1950, has more than 5,000 subscribers. In 2004, 49,000 people attended its concerts. The Haifa Cinematheque, founded in 1975, hosts the annual Haifa International Film Festival during the intermediate days of the Sukkot holiday. Haifa has 29 movie theaters. The city publishes a local newspaper, Yediot Haifa, and has its own radio station, Radio Haifa. The Israeli Arabic-language newspapers Al-Ittihad and Al-Madina are also based in Haifa. During the 1990s, Haifa hosted the Haifa Rock & Blues Festival featuring Bob Dylan, Nick Cave, Blur and PJ Harvey. The last festival was held in 1995 with Sheryl Crow, Suede and Faith No More as headliners. Haifa has over a dozen museums. The most popular museum is the Israel National Museum of Science, Technology, and Space, which recorded almost 150,000 visitors in 2004. The museum is located in the historic Technion building in the Hadar neighborhood. The Haifa Museum of Art houses a collection of modern and classical art, as well as displays on the history of Haifa. The Tikotin Museum of Japanese Art is the only museum in the Middle East dedicated solely to Japanese art. Other museums in Haifa include the Museum of Prehistory, the National Maritime Museum and Haifa City Museum, the Hecht Museum, the Dagon Archaeological Museum of Grain Handling, the Railway Museum, the Clandestine Immigration and Naval Museum, the Israeli Oil Industry Museum, and Chagall Artists' House. As part of his campaign to bring culture to Haifa, Mayor Abba Hushi provided the artist Mane-Katz with a building on Mount Carmel to house his collection of Judaica, which is now a museum.. The former home and studio of artist Hermann Struck is now the Hermann Struck Museum. The Haifa Educational Zoo at Gan HaEm park houses a small animal collection including Syrian brown bears, now extinct from Israel. Wןthin the zoo is the Pinhas House biology institute. In the close vicinity of Haifa, on the Carmel, the Northern "Hai-Bar" ("wild life") operated by Israel's Parks and Reserves Authority for the purpose of breeding and reintroduction of species now extinct from Israel, such as Persian Fallow Deer. As an industrial port city, Haifa has traditionally been a Labor party stronghold. The strong presence of dock workers and trade unions earned it the nickname 'Red Haifa.' In addition, many prominent Arabs in the Israeli Communist Party, among them Tawfik Toubi, Emile Habibi, Zahi Karkabi, Bulus Farah and Emile Toma, were from Haifa. In recent years, there has been a drift toward the center. This was best signified by, in the 2006 legislative elections, the Kadima party receiving about 28.9% of the votes in Haifa, and Labor lagging behind with 16.9%. 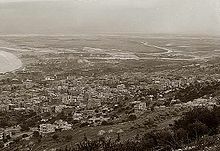 Before 1948, Haifa's Municipality was fairly unusual as it developed cooperation between the mixed Arab and Jewish community in the city, with representatives of both groups involved in the city's management. Under mayor al-Haj, between 1920 and 1927, the city council had six Arab and two Jewish representatives, with the city run as a mixed municipality with overall Arab control. Greater cooperation was introduced under Hasan Bey Shukri, who adopted a positive and conciliatory attitude toward the city's Jews and gave them senior posts in the municipality. In 1940, the first Jewish mayor, Shabtai Levy, was elected. Levy's two deputies were Arab (one Muslim, the other Christian), with the remainder of the council made up of four Jews and six Arabs. Today, Haifa is governed by its 12th city council, headed by the mayor Yona Yahav. The results of municipal elections decide on the makeup of the council, similarly to the Knesset elections. The city council is the legislative council in the city, and has the authority to pass auxiliary laws. The 12th council, which was elected in 2003, has 31 members, with the liberal Shinui-Greens ticket holding the most seats (6), and Likud coming second with 5. Many of the decisions passed by the city council are results of recommendation made by the various municipal committees, which are committees where non-municipal organs meet with representatives from the city council. Some committees are spontaneous, but some are mandatory, such as the security committee, tender committee and financial committee. The Technion, called "Israel's MIT"
Haifa medical facilities have a total of 4,000 hospital beds. The largest hospital is the government-operated Rambam Hospital with 900 beds and 78,000 admissions in 2004. Bnai Zion Medical Center and Carmel Hospital each have 400 beds. Other hospitals in the city include the Italian Hospital, Elisha Hospital (100 beds), Horev Medical Center (36 beds) and Ramat Marpe (18 beds). Haifa has 20 family health centers. In 2004, there were a total of 177,478 hospital admissions. Rambam Medical Center was in the direct line of fire during the Second Lebanon War in 2006 and was forced to take special precautions to protect its patients. Whole wings of the hospital were moved to large underground shelters. Haifa is home to two internationally acclaimed universities and several colleges. The University of Haifa, founded in 1963, is at the top of Mt. Carmel. The campus was designed by the architect of Brasília and United Nations Headquarters in New York City, Oscar Niemeyer. The top floor of the 30-story Eshkol Tower provides a panoramic view of northern Israel. The Hecht Museum, with important archeology and art collections, is on the campus of Haifa University. 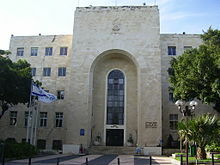 The Technion – Israel Institute of Technology, described as Israel's MIT, was founded in 1912. It has 18 faculties and 42 research institutes. The original building now houses Haifa's science museum. The Hebrew Reali School was founded in 1913. It is the largest k-12 school in Israel, with 4,000 students in 7 branches, all over the city. The first technological high school in Israel, Bosmat, was established in Haifa in 1933. Other academic institutions in Haifa are the Gordon College of Education and Sha'anan Religious Teachers' College, the WIZO Haifa Academy of Design and Education, and Tiltan College of Design. 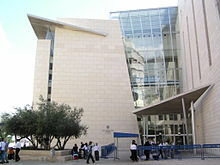 The Michlala Leminhal College of Management and the Open University of Israel have branches in Haifa. The city also has a nursing college and the P.E.T Practical Engineering School. As of 2006[update]–07, Haifa had 70 elementary schools, 23 middle schools, 28 academic high schools and 8 vocational high schools. There were 5,133 pupils in municipal kindergartens, 20,081 in elementary schools, 7,911 in middle schools, 8,072 in academic high schools, 2,646 in vocational high schools, and 2,068 in comprehensive district high schools. 86% of the students attended Hebrew-speaking schools and 14% attended Arab schools. 5% were in special education. In 2004, Haifa had 16 municipal libraries stocking 367,323 books. Two prestigious Arab schools in Haifa are the Orthodox School, run by the Greek Orthodox church, and the Nazareth Nuns' School, a Catholic institution. Haifa is served by six railway stations and the Carmelit, currently Israel's only subway system (another is under construction in Tel Aviv). The Nahariya–Tel Aviv Coastal Railway main line of Israel Railways runs along the coast of the Gulf of Haifa and has six stations within the city. From south-west to north-east, these stations are: Haifa Hof HaCarmel, Haifa Bat Galim, Haifa Merkaz HaShmona, HaMifrats Central, Hutzot HaMifratz and Kiryat Haim. Together with the Kiryat Motzkin Railway Station in the northern suburb Kiryat Motzkin, they form the Haifa – Krayot suburban line ("Parvarit"). There are direct trains from Haifa to Tel Aviv, Ben Gurion International Airport, Nahariya, Akko, Kiryat Motzkin, Binyamina, Lod, Ramla, Beit Shemesh, Jerusalem and other locations, but all trains to Beersheba skips all Haifa stations. Lines to the North of the country use HaMifratz Central Bus Station and their coverage includes most towns in the North of Israel. Lines heading south use Haifa Hof HaCarmel Central Bus Station. Destinations directly reachable from Hof HaCarmel CBS include Tel Aviv, Jerusalem, Eilat, Raanana, Netanya, Hadera, Zikhron Ya'akov, Atlit, Tirat Carmel, Ben Gurion International Airport and intermediate communities. There are also three Egged lines that have their terminus in the Ramat Vizhnitz neighborhood and run to Jerusalem, Bnei Brak and Ashdod. These used to be "mehadrin" (i.e. gender segregated) lines. All urban lines are run by Egged. There are also share taxis that run along some bus routes but do not have an official schedule. In 2006, Haifa implemented a trial network of neighborhood mini-buses – named "Shkhunatit" and run by Egged. In December 2012, GetTaxi, an app and taxi service which allows users to hail a cab using their smartphone without contacting the taxi station (by identifying and summoning the closest taxi) began operating. In the current initial phase, 50 taxis from the service are operating in Haifa. Haifa and the Krayot suburbs also have a new Phileas concept bus rapid transit system called the Metronit. These buses, operating with hybrid engines, follow optical strips embedded in designated lanes of roads, providing tram-like public transportation services. The Metronit consists of 100 18-meter buses, each with the capacity for 150 passengers, operating along 40 km (25 mi) of designated roadways. The new system officially opened on 16 August 2013 serving three lines. Haifa is one of the few cities in Israel where buses operate on Shabbat. Bus lines operate throughout the city on a reduced schedule from late Saturday morning onwards, and also connect Haifa with Nesher, Tirat Karmel, Yokneam, Nazareth, Nazareth Illit and intermediate communities. Since the summer of 2008, night buses are operated by Egged in Haifa (line 200) and the Krayot suburbs (line 210). During the summer of 2008 these lines operated 7 nights a week. Since 2013, along with route 1 of the Metronit, they operate 7 nights a week, making Haifa as the only city in Israel with 24/7 public transportation. 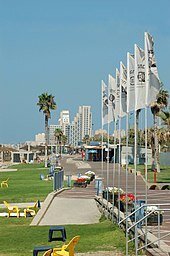 Haifa is also the only city in Israel to operate a Saturday bus service to the beaches during summer time. Egged lines run during Saturday mornings from many neighborhoods to the Dado and Bat Galim beaches, and back in the afternoon. The Haifa underground railway system is called Carmelit. It is a subterranean funicular on rails, running from downtown Paris Square to Gan HaEm (Mother's Park) on Mount Carmel. With a single track, six stations and two trains, it is listed in Guinness World Records as the world's shortest metro line. The Carmelit accommodates bicycles. Haifa also has a cable car. The Haifa Cable Car gondola lift consists of six cabins and connects Bat Galim on the coast to the Stella Maris observation deck and monastery atop Mount Carmel. It serves mainly tourists. There are currently plans to add a 4.4 kilometre commuter cable car service to Haifa's public transport system, running from HaMifratz Central Bus Station at the foot of Mount Carmel to the Technion, and then to the University of Haifa. Haifa Airport serves domestic flights to Tel Aviv and Eilat as well as international charters to Cyprus, Greece and Jordan. The airliners that operate flights from Haifa are Arkia and Israir. There are currently plans to expand services from Haifa. Cruise ships operate from Haifa port primarily to destinations in the Eastern Mediterranean, Southern Europe and Black Sea. Travel between Haifa and the center of the country is possible by road with Highway 2, the main highway along the coastal plain, beginning at Tel Aviv and ending at Haifa. 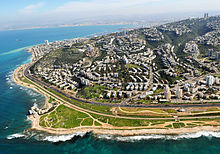 Furthermore, Highway 4 runs along the coast to the north of Haifa, as well as south, inland from Highway 2. In the past, traffic along Highway 2 to the north of Haifa had to pass through the downtown area of the city; the Carmel Tunnels, opened for traffic 1 December 2010, now route this traffic under Mount Carmel, reducing congestion in the downtown area. 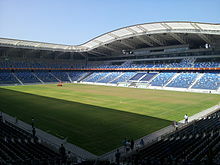 The main stadiums in Haifa are: Sammy Ofer Stadium, a UEFA-approved 30,820 seat stadium, completed in 2014, replacing the 14,002-seat Kiryat Eliezer Stadium that was demolished 2016, Thomas D'Alesandro Stadium and Neve Sha'anan Athletic Stadium that seats 1,000. The city's two main football clubs are Maccabi Haifa and Hapoel Haifa who both currently play in the Israeli Premier League and share the Sammy Ofer Stadium as their home pitch. Maccabi has won twelve Israeli titles, while Hapoel has won one. Haifa has a professional basketball club, Maccabi Haifa. Maccabi Haifa plays in Israeli Basketball Super League, the top division. The team plays at Romema Arena, which seats 5,000. The city also has an American football club, the Haifa Underdogs, that are a part of the Israeli Football League and play in Yoqneam Stadium. The team lost in the championship game of the league's inaugural season, but won one title as part of American Football Israel, which merged with the Israeli Football League in 2005. The city has several clubs in the regional leagues, including Beitar Haifa in Liga Bet (the fourth tier) and Hapoel Ahva Haifa, F.C. Haifa Ruby Shapira and Maccabi Neve Sha'anan Eldad in Liga Gimel (the fifth tier). The Haifa Hawks are an ice hockey team based out of the city of Haifa. They participate in the Israeli League, the top level of Israeli ice hockey. In 1996, the city hosted the World Windsurfing Championship. The Haifa Tennis Club, near the southwest entrance to the city, is one of the largest in Israel. John Shecter, Olympic horse breeder and owner of triple cup champion Shergar was born here. ^ "List of localities, in Alphabetical order" (PDF). Israel Central Bureau of Statistics. Retrieved 26 August 2018. ^ a b c Bosworth, Clifford Edmund (2007). Historic cities of the Islamic world (Illustrated ed.). BRILL. pp. 149–151. ISBN 9789004153882. Retrieved 2 July 2011. ^ "Localities in Israel – 2014". Israel Central Bureau of Statistics. Archived from the original on 3 October 2015. Retrieved 2 October 2015. ^ a b "Haifa". Jewish Agency. Archived from the original on 26 September 2007. Retrieved 5 May 2007. ^ a b UNESCO World Heritage Centre (8 July 2008). "Three new sites inscribed on UNESCO's World Heritage List". Retrieved 8 July 2008. ^ "GavYam". Gav-Yam.co.il. Archived from the original on 15 April 2008. Retrieved 18 February 2008. ^ "Carmelit Underground Train, Haifa". touristisrael.com. Retrieved 19 September 2016. ^ Cohen, Amiram. "U.S. Checking Possibility of Pumping Oil from Northern Iraq to Haifa, via Jordan". Haaretz. Retrieved 6 December 2008. ^ a b c Carmel, Alex (2002). The History of Haifa Under Turkish Rule (in Hebrew) (4th ed.). Haifa: Pardes. p. 14. ISBN 965-7171-05-9. ^ Amit-Kokhavi, Hanah (2006). "Haifa—sea and mountain, Arab past and Jewish present, as reflected by four writers". Israel Studies. 2 (3): 142–167. doi:10.1353/is.2006.0025. ^ Guide to Palestine and Syria: Macmillan's guides (5th ed.). Macmillan and Company. 1910. Retrieved 2 July 2011. ^ a b c Dumper, Michael; Stanley, Bruce E. (2007). Cities of the Middle East and North Africa: a historical encyclopedia (Illustrated ed.). ABC-CLIO. ISBN 9781576079195. Retrieved 2 July 2011. ^ a b c d e f g Sharon, Moshe; Fondation Max van Berchem (2007). Corpus Inscriptionum Arabicarum Palaestinae addendum: squeezes in the Max van Berchem collection (Palestine, Trans-Jordan, Northern Syria) (Illustrated ed.). BRILL. ISBN 9789004157804. Retrieved 2 July 2011. ^ a b c "Quarterly statement – Palestine Exploration Fund". Palestine Exploration Fund. 1876. Retrieved 2 July 2011. ^ Negev, Avraham; Gibson, Shimon (2005). Archaeological encyclopedia of the Holy Land (4th, revised, illustrated ed.). Continuum International Publishing Group. pp. 213–214. ISBN 9780826485717. ^ a b le Strange, Guy (1890). "Palestine Under the Moslems: A Description of Syria and the Holy Land from A.D. 650 to 1500". Committee of the Palestine Exploration Fund: 446. Retrieved 26 July 2009. ^ Freyne, Seán; Rodgers, Zuleika; Daly-Denton, Margaret; Fitzpatrick-McKinley, Anne (2009). A wandering Galilean: essays in honour of Seán Freyne. BRILL. ISBN 9789004173552. Retrieved 2 July 2011. ^ a b c d Seikaly, May (2002). Haifa: Transformation of an Arab Society 1918–1939 (Illustrated, reprint ed.). I.B. Tauris. p. 15. ISBN 9781860645563. Retrieved 2 July 2011. ^ Seikaly, 2002, p. 65. ^ "Kishon". HighBeam Encyclopedia (Colombia Encyclopedia). Retrieved 20 March 2008. ^ "Book Excerpt: Frommer's Guide to Israel, "Haifa"". Bahai-library.com. 21 April 1948. Retrieved 5 May 2009. ^ "Two Tombstones from Zoar in the Hecht Museum Collection" (PDF). Haifa University. Archived from the original (PDF) on 26 February 2008. Retrieved 25 January 2008. ^ "Haifa". Jewish Virtual Library. Retrieved 20 January 2008. ^ Negev, Avraham; Gibson, Shimon (1 July 2005). Archaeological encyclopedia of the Holy Land (4th, revised, illustrated ed.). Continuum International Publishing Group. p. 213. ISBN 9780826485717. ^ a b Grabois, Aryeh (March 1985). Shiller, Eli; Ben-Artzi, Yossi (eds.). "Haifa and Its Settlement in the Middle Ages". Ariel: Haifa and Its Sites (in Hebrew) (37–39): 48–49. ^ a b Carmel, Alex (2002). The History of Haifa Under Turkish Rule (in Hebrew) (4th ed.). Haifa: Pardes. p. 17. ISBN 965-7171-05-9. ^ "Origins of the Carmelites". Carmelite.org.uk. Retrieved 20 March 2008. ^ "Stella Maris Lighthouse, Church and Carmelite Monastery". Frommers. Retrieved 11 April 2008. ^ "Haifa in the Middle Ages". Tour-Haifa.co.il. Retrieved 15 February 2008. ^ Hütteroth, Wolf-Dieter; Abdulfattah, Kamal (1977). Historical Geography of Palestine, Transjordan and Southern Syria in the Late 16th Century. Erlanger Geographische Arbeiten, Sonderband 5. Erlangen, Germany: Vorstand der Fränkischen Geographischen Gesellschaft. p. 158. ^ Hohlfelder, Robert L. (1988). Irad Malkin; Robert L. Hohlfelder (eds.). Mediterranean cities: historical perspectives (Illustrated, annotated, reprint ed.). Routledge. p. 42. ISBN 9780714633534. Retrieved 2 July 2011. ^ Sharon, Moshe (2013). Corpus Inscriptionum Arabicarum Palaestinae: H-I. 5. BRILL. p. 262. ISBN 9789004254817. 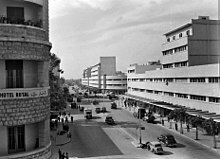 ^ "Haifa during the British Mandate Period". Tour-Haifa.co.il. Retrieved 15 February 2008. ^ a b c d e "Modern Haifa". Tour-Haifa.co.il. Retrieved 15 February 2008. ^ "Templers". University of Haifa. Archived from the original on 1 July 2007. Retrieved 27 January 2008. ^ Gaon, Moshe David. "The History of the Sephardi Jews in Israel". ^ "Golden anniversary of the Queen of Carmel". Bahá'í World News Service. 12 October 2003. Retrieved 12 May 2007. ^ a b Eyadat, Fadi (24 September 2010). "On Haifa Day India salutes World War I troops". Haaretz.com. Retrieved 24 March 2013. ^ Michael Dumper; Bruce E. Stanley (2007). Cities of the Middle East and North Africa: A Historical Encyclopedia. ABC-CLIO. pp. 161–. ISBN 978-1-57607-919-5. ^ "Knighthood — Sir `Abdu'l-Bahá Abbas Effendi". ^ a b Reinhard Schulze. A modern history of the Islamic world. p.98. ^ J. B. Barron, ed. (1923). Palestine: Report and General Abstracts of the Census of 1922. Government of Palestine. Table XI . ; E. Mills, ed. (1932). Census of Palestine 1931. Population of Villages, Towns and Administrative Areas. Jerusalem: Government of Palestine. p. 91. ^ Supplement to a Survey of Palestine (p. 12–13) which was prepared by the British Mandate for the United Nations in 1946–47. ^ "Haifa Municipality – Aliya Web Site". .haifa.muni.il. Archived from the original on 12 October 2013. Retrieved 13 October 2013. ^ Supplement to a Survey of Palestine. Retrieved 11 April 2008. ^ Palestine Post, many issues December 1947. ^ Benny Morris, The Birth of the Palestinian Refugee Problem Revisited, p101. ^ "The Palestine Refugee Problem". Mideastweb.org. Retrieved 5 May 2009. ^ Karsh, Efraim. Palestine Betrayed. New Haven: Yale UP, 2010. 124. Print. ^ Pappe, Ilan. The Ethnic Cleansing of Palestine, p. 96, citing Zadok Eshel, "The Carmeli Brigade in the War of Independence", p. 147. ^ Morris, Benny (1987), "The birth of the Palestinian refugee problem, 1947–1949". Cambridge University Press. ISBN 0-521-33028-9. Page 315. Quoting CP v/4/102, Stockwell Report. He comments: "Nor is there any evidence that a "massacre" took place in the town." ^ "History since Independence". Haifa Municipality. Retrieved 9 April 2008. ^ a b c Johal, Am (18 August 2004). "Sifting Through the Ruins: Historic Wadi Salib Under Pressure". Media Monitors Network. Archived from the original on 28 September 2007. ^ "In focus: Haifa". BBC News. 6 September 2006. Retrieved 9 April 2008. ^ "8 killed in rocket attack on Haifa – Israel News, Ynetnews". Ynetnews.com. 20 June 1995. Retrieved 12 March 2013. ^ "Katyusha rocket hit Haifa oil refineries complex during Second Lebanon War – Haaretz – Israel News". Haaretz. Retrieved 5 May 2009. ^ a b c d "Demography" (PDF). Haifa Municipality. Archived from the original (PDF) on 9 April 2008. Retrieved 22 March 2008. ^ a b c "The Arab Population of Israel 2003" (PDF). Israel Central Bureau of Statistics. Archived from the original (PDF) on 1 December 2007. Retrieved 3 January 2008. ^ a b "Haifa: Greatest business potential – Israel Business, Ynetnews". Ynetnews.com. 20 June 1995. Retrieved 24 March 2013. ^ a b c "Is Haifa Ageing?". Central Bureau of Statistics, Statistical Abstract of Israel, no. 56, 2005. urbaneconomics.blogspot.com. 6 December 2006. Retrieved 10 February 2008. "Kababir". Israel and You. Archived from the original on 30 January 2015. Retrieved 26 January 2015. ^ Hoval, Revital (1 September 2011). "Secular residents worry about Haifa neighborhood turning into 'another Bnei Brak' – Israel News | Haaretz Daily Newspaper". Haaretz.com. Retrieved 24 March 2013. ^ Hadid, Diaa (4 January 2016). "In Israeli City of Haifa, a Liberal Palestinian Culture Blossoms". The New York Times. Retrieved 4 January 2016. ^ "Haifa, Israel". Timeanddate.com. Retrieved 20 March 2008. ^ a b c d e "Haifa – General info". Israeli Ministry of Tourism. Retrieved 20 March 2008. ^ "Road Distances Chart" (PDF). Israel Ministry of Tourism. Archived from the original (PDF) on 9 April 2008. Retrieved 20 March 2008. ^ Israel. Encarta. Archived from the original on 1 November 2009. Retrieved 20 March 2008. ^ "Haifa". Jewish Virtual Library. Retrieved 21 March 2008. ^ a b "Haifa". Israel Government Tourism Ministry. Retrieved 21 March 2008. ^ a b c "Building" (PDF). Haifa Statistical Yearbook. Haifa Municipality. Archived from the original (PDF) on 9 April 2008. Retrieved 21 February 2008. ^ "high-rise buildings | Buildings". Emporis. Retrieved 12 March 2013. ^ "Gad Zeevi demands Haifa permit high-rises on the Carmel". Globes. 17 October 2004. Retrieved 12 March 2013. ^ "Plan aims to turn Haifa into 'the Barcelona of Israel' – Israel Business, Ynetnews". Ynetnews.com. 20 June 1995. Retrieved 12 March 2013. ^ a b "Dozens of hotels planned in Haifa – Israel Travel, Ynetnews". Ynetnews.com. 20 June 1995. Retrieved 12 March 2013. ^ "Move of Haifa Bay's ammonia tank tangled in red tape – Israel Environment, Ynetnews". Ynetnews.com. 20 June 1995. Retrieved 12 March 2013. ^ "Plan aims to turn Haifa into 'the Barcelona of Israel' – Israel Business, Ynetnews". Ynetnews.com. 20 June 1995. Retrieved 24 March 2013. ^ "Haifa residents invited to 'smash wall' – Israel Travel, Ynetnews". Ynetnews.com. 20 June 1995. Retrieved 12 March 2013. ^ "NIS 600m Disney park, multiplex planned for Haifa". Globes. 3 January 2011. Retrieved 12 March 2013. ^ "Haifa outline plan filed for objections". Globes.co.il. 26 February 2014. Retrieved 16 July 2014. ^ "Tel Aviv: "Haifa works, Jerusalem prays, and Tel Aviv plays"". Daily Telegraph. London. 14 November 2000. Archived from the original on 15 April 2008. Retrieved 23 March 2008. ^ a b "Haifa Today". Haifa Foundation. Retrieved 21 March 2008. ^ "Haifa". GlobalSecurity.org. Retrieved 17 February 2008. ^ "Haifa Oil Refinery Cooling Towers". Emporis.com. Retrieved 17 February 2008. ^ "Israel". American.edu. Retrieved 17 February 2008. ^ "IBM Haifa Labs". IBM Haifa Labs. Retrieved 27 January 2008. ^ "Haifa Port". Haifa Port. Archived from the original on 24 January 2008. Retrieved 27 January 2008. ^ "Haifa Shopping Centers". Tour-Haifa.co.il. Retrieved 19 February 2008. ^ "Building to begin on Haifa life sciences park". Globes. 13 June 2012. Retrieved 24 March 2013. ^ a b "Hotels and Tourism" (PDF). Haifa Statistical Yearbook. Haifa Municipality. Archived from the original (PDF) on 26 February 2008. Retrieved 14 February 2008. ^ a b c d e f "Leisure Activity" (PDF). Haifa Statistical Yearbook. Haifa Municipality. p. 56. Retrieved 14 February 2008. ^ "Terraces of the Shrine of the Bab". Retrieved 11 April 2008. ^ "Baha'i World Center". Baha'i International Community. Retrieved 20 March 2008. 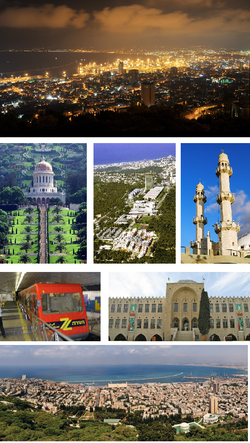 ^ "Tours of Haifa". Retrieved 11 April 2008. ^ "Eih Hod". ddtrave-acc.com. Retrieved 20 January 2008. ^ "Mount Carmel National Park". Archived from the original on 2 March 2008. Retrieved 11 April 2008. ^ "Making Haifa into an international tourist destination". Haaretz. 30 May 2007. Retrieved 10 March 2008. ^ a b "Culture & Leisure". Tour-Haifa.co.il. Retrieved 18 February 2008. ^ "The Congress Center". Haifa Municipality. Retrieved 2 April 2008. ^ "Haifa Symphony". Haifa Symphony. Archived from the original on 17 December 2007. Retrieved 20 January 2008. ^ "Israel Newspapers". Abyznewslinks.com. Retrieved 27 January 2008. ^ "Radio Broadcasting Stations". Radiostationworld.com. Retrieved 26 January 2008. ^ "Haifa Museums". Get2Israel.com. Archived from the original on 29 February 2008. Retrieved 18 February 2008. ^ "Hecht Museum homepage". Hecht Museum. Archived from the original on 11 October 2014. Retrieved 13 October 2014. ^ "Dagan Grain Silo and Museum, Haifa". Nahariya.info – Nahariya and the Western Galilee. Retrieved 13 October 2014. ^ "Dagon Collection – Archaeological Museum of Grain Handling in Israel". Israel Arts Directorye. Retrieved 13 October 2014. ^ "The Mane Katz Museum". Tour-Haifa.co.il. Retrieved 25 January 2008. ^ Kamin, Debra (3 October 2013). "Home of Haifa artist Hermann Struck is reborn as museum". Times of Israel. Retrieved 9 January 2019. ^ "Haifa through the looking glass". Le Monde Diplomatique. 13 December 2005. Retrieved 23 January 2008. ^ "'Red Haifa' in revolt against Labor". Highbeam Research – Originally from Jerusalem Post. 1 February 1999. Archived from the original on 5 April 2012. Retrieved 23 January 2008. ^ Schwartz, Stephen (26 July 2006). "The Mysteries of Safed, The Banners of Haifa,". Islampluralism.org. Archived from the original on 27 September 2007. Retrieved 23 January 2008. ^ "Haifa 2006 election results". Yedioth Ahronoth (in Hebrew). Retrieved 23 January 2008. ^ Eyadat, Fadi (18 February 2010). "Haifa honors first mayor's legacy of coexistence". Haaretz.com. Retrieved 24 March 2013. ^ Daniel Monterescu, Dan Rabinowitz (2007). Mixed Towns, Trapped Communities: Historical Narratives, Spatial Dynamics. Ashgate Publishing, Ltd. pp. 113–132. ISBN 978-0-7546-4732-4. Retrieved 26 July 2009. ^ "City Council Overview" (in Hebrew). Haifa Municipality. Archived from the original on 17 January 2008. ^ "Members of the 12th City Council" (in Hebrew). Haifa Municipality. Archived from the original on 17 January 2008. ^ "Municipal Committees" (in Hebrew). Haifa Municipality. Archived from the original on 17 January 2008. ^ "research at rambam". Rambam.org.il. Retrieved 5 May 2009. ^ Berg, Raffi (20 July 2006). "Haifa hospital in the firing line". BBC News. Retrieved 5 January 2010. ^ Raved, Ahiya (7 August 2006). "Haifa hospital goes underground". Ynetnews. Retrieved 18 February 2008. ^ "The closing of a dream come true". Haaretz. Retrieved 25 January 2008. ^ "A Cross-Section of Israeli Reality, Here and Now". Wizodzn.ac.il. 22 September 2006. Archived from the original on 14 May 2013. Retrieved 24 March 2013. ^ a b "Education" (PDF). Haifa Statistical Yearbook 2007. Haifa Municipality. 1 June 2007. Archived from the original (PDF) on 26 February 2008. Retrieved 14 February 2008. ^ Ratner, David (25 May 2004). "Haifa's Christian schools lead the league". Haaretz.com. Retrieved 24 March 2013. ^ "Railway Map". Israel Railways. Archived from the original on 1 March 2007. Retrieved 22 February 2008. ^ "Egged to start minibus project in Haifa". Jerusalem Post. 9 June 2006. Archived from the original on 18 July 2011. Retrieved 22 February 2008. ^ "GetTaxi extends service to Haifa". Globes. 4 December 2012. Retrieved 13 October 2013. ^ Friedman, Ron. 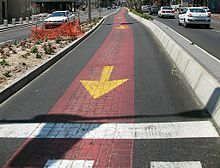 "Haifa to get new 'Metronit' Bus Rapid Transit system by 2011 | JPost | Israel News". JPost. Retrieved 13 October 2013. ^ "Metronit" (in Hebrew). Yefenof.co.il. Archived from the original on 21 February 2008. Retrieved 22 February 2008. ^ a b c "Haifa: Planning a Trip". Frommers. Archived from the original on 15 April 2008. Retrieved 22 February 2008. ^ "Night buses in Haifa & Krayot at the Egged official website". Egged. Retrieved 19 November 2008. ^ "Summer routes to the beaches at the Egged official website". Egged. Retrieved 20 November 2008. ^ "The Carmelit". Tour-Haifa.co.il. Retrieved 19 February 2008. ^ "Haifa". Weizmann Institute. Archived from the original on 19 January 2008. Retrieved 22 February 2008. ^ "אתר עיריית חיפה – פרוייקטים". .haifa.muni.il. Archived from the original on 18 June 2013. Retrieved 12 March 2013. ^ "Carmel Tunnels". Israel MOF. Archived from the original on 12 July 2012. Retrieved 22 February 2008. ^ "Future Stadiums". World Stadiums. Retrieved 17 February 2008. ^ "IC Members Facilities". ic-tennis.org. Archived from the original on 4 April 2009. Retrieved 13 December 2009. ^ Portsmouth City Council. Twinning Archived 26 September 2011 at the UK Government Web Archive. Retrieved 22 August 2007. ^ "Sister Cities of Manila". © 2008–2009 – City Government of Manila. Archived from the original on 6 August 2009. Retrieved 2 July 2009. Carmel, Alex (2002). The History of Haifa Under Turkish Rule (in Hebrew) (4th ed.). Haifa: Pardes. ISBN 965-7171-05-9. Shiller, Eli; Ben-Artzi, Yossi (1985). 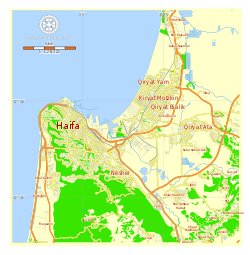 Haifa and its sites (in Hebrew). 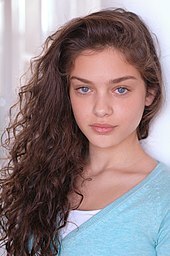 Jerusalem: Ariel. "Haifa" . Encyclopædia Britannica. 12 (11th ed.). 1911. 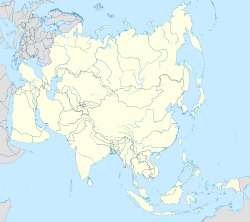 This page was last edited on 12 April 2019, at 12:14 (UTC).